protection training is commonly mistaken for attack training and in my eyes its completely 2 different things. my dogs were all well socialized before they ever met a sleeve for bite work, this was to make sure that there were no human aggregation problem that could be made worse the bite work. we introduce the dog to different s scenarios and teach them how to react , with a bit of time they know the difference between a jogger running past you, a drunk saying hello, or someone really attacking you and respond appropriately. 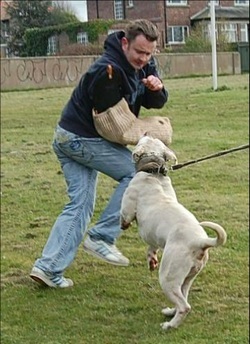 With a deadacated handler mans best friend can be mans best defender. All dogs can be tought to do this but diffent breed do better than other, my persol prefrence is bull breeds. commenly mastaken as "fighting dogs" these breeds and strong and Courageous. Above anything else these breeds do make excellent family pets for the right family pets. If you are thinking of getting a dog we can give advice on the dog to suit your needs and life stile. once your dog is picked we can help socialize your dog so its all and more than you can ask of. Dogs we that i find best for the sports we most train in are American bulldogs, presa canerio, Staffordshire, alano, rottweiller, these all make well rounded dogs, if your interest lies in just personal protection german shepherd and belgim milanois might be the way to go. we are happy to abvise anyone on any breed and were there strengths lie.